Paint comes in so many colors that it can be hard to pick the right one. Eliminate the confusion with these simple tips for choosing paint colors. Why is choosing paint colors always so hard? Paint comes in so many different colors that you can get virtually any shade you want, and then some. That’s why! Looking at all of those choices, how do you know which slightly-different variation of a color is right for your room? Having painted a lot of rooms (and re-painted a few of them after choosing the wrong paint color), I have come up with some ways to help make the choice a little easier. And eliminate those re-do’s! So I thought I’d share my process, and hopefully it will help you choose the right paint color too! The first step in my process for how to choose the right paint color actually starts before the paint color stage. 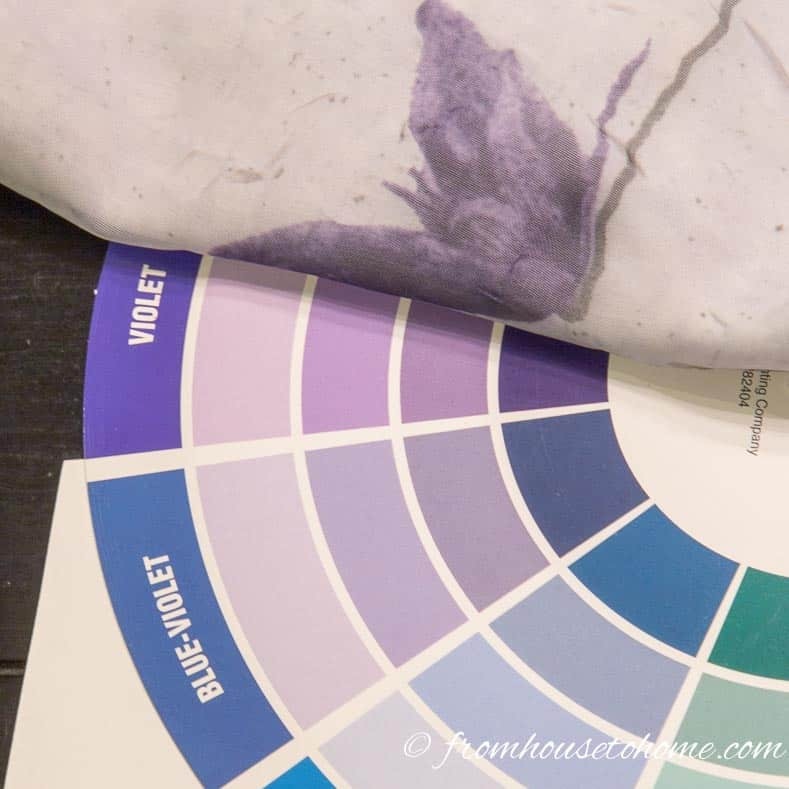 If you’ve read my other home decor color posts, you know that I start with a whole house color scheme, then go to picking a room color palette and then get to this stage–choosing paint colors. If you haven’t had a chance to read those other two steps, you might want to do that first. 1. 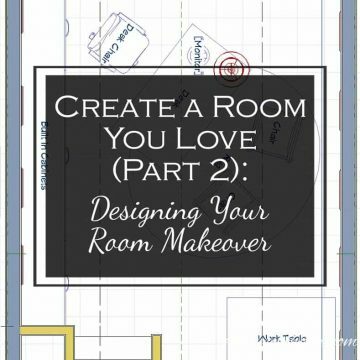 Start by finding something to use for an inspiration…a piece of fabric, artwork, area rug, favorite shirt…anything that has colors you love. 2. Decide how you want the room to feel. 3. 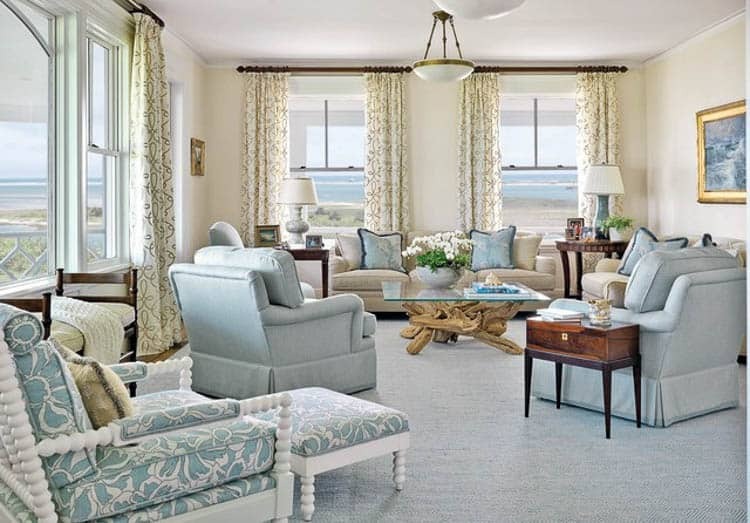 Determine if you want a cozy and intimate room, or a light and airy room. 4. Follow the 60-30-10 rule to pick your main colors. The 60% color is usually your wall color. In other words, you need to know generally what color you want to use in order to pick out variations to try. 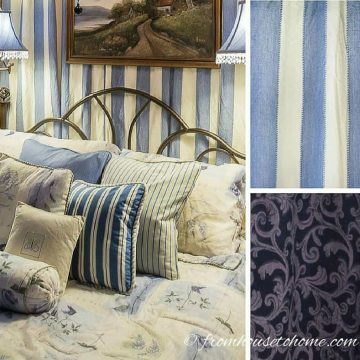 For my guest bedroom makeover, I found a duvet cover that I loved. So I used it as the inspiration for my color choices. The second step in picking a paint color is to try it out online before you even leave the house. 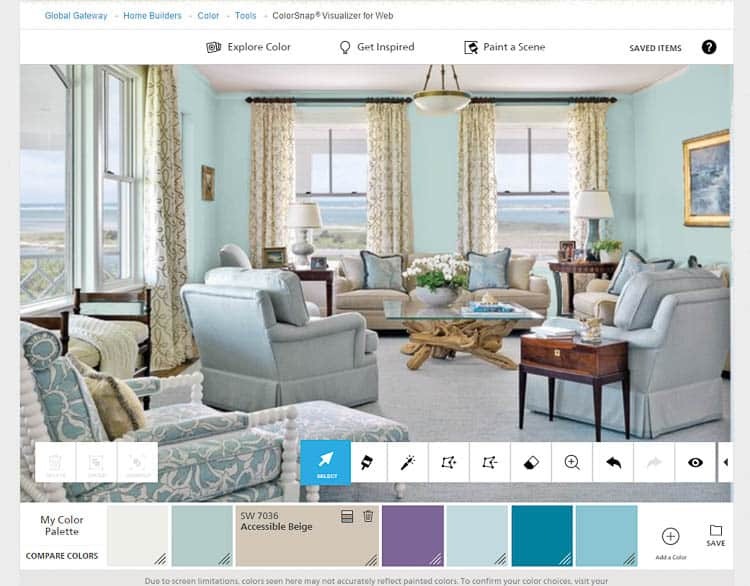 Sherwin Williams has an online app that you can use either on your computer or on your phone to visualize your walls in different colors. 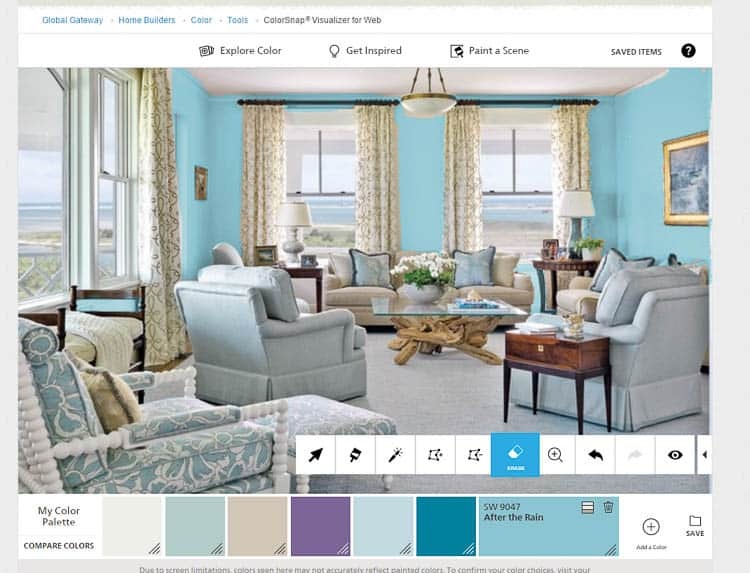 Upload a picture of your room and use the brush tool to paint over the walls with different paint colors to get a feel for what they look like. If you already have some of the furniture you will be using in the room, it is helpful to include some of it in the picture, too. That way you’ll see how it goes as well. It’s fairly easy to use and once you have selected the wall areas, you can change the colors on them with a couple of clicks. 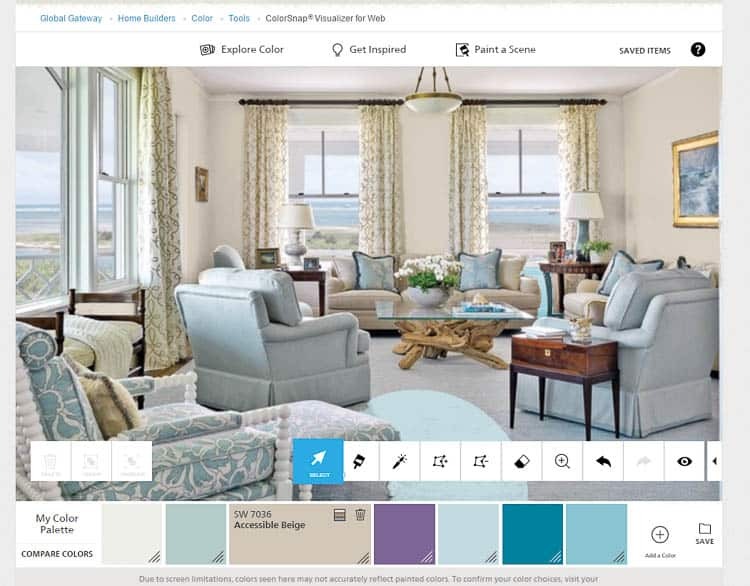 Of course, since the app is from Sherwin Williams, the color selections are, too, but even if you aren’t using their paint, you should be able to find something similar to the color you want to use. This is the picture above in a light teal color. Here it is in a green-based color. And here is a slightly darker beige. By doing this I’m usually able to eliminate some of my choices after seeing them in the online version of my room. Choosing paint colors is a lot easier when you can see it in the space! 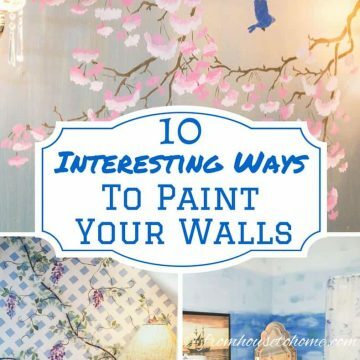 Note: If you get to this point, have a really good idea what color from your inspiration you want to use for your walls, and have an inspiration piece that has clear colors on it, you may be able to skip the rest of these steps by going to the paint store and having them color match your inspiration. I have had some good experiences and some bad experiences doing this (I think a lot of it depends on the skill of the person who is helping you). In my case, the fabric had too many variations in color so I didn’t go that route. It’s okay if you have more than one color from your inspiration that you think might be a good wall color. If you can’t decide whether to go with the teal or the ivory, follow these steps for both colors and hopefully one will come out on top in the end. By now, hopefully you have a pretty good idea of what color your are looking for. 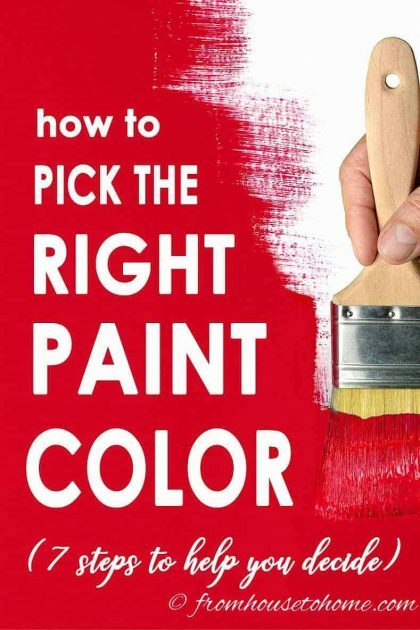 So the third step for how to choose the right paint color is to actually get some paint chips. If you used the app from the last step to choose some colors, you can get the paint chips for those. Don’t worry if you are not planning on using Sherwin Williams paint. 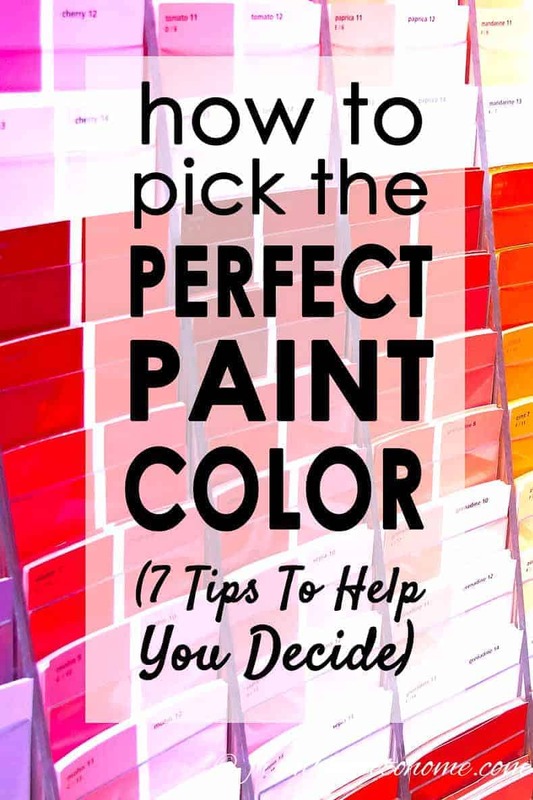 After you have picked the color you want, you can take the Sherwin Williams chip into pretty much any paint store and they can look up the color for you. 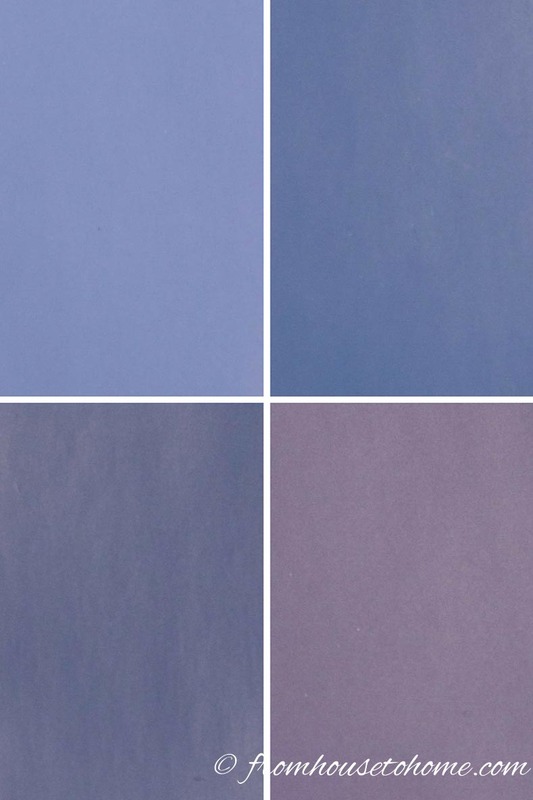 I also take a look through the paint chips at my local store and see if there are any other similar colors that I think I might like. You don’t need edit yourself too much at this point…we’ll narrow them down in the next steps. Try to get the paint cards that have a range of tints for the same color. 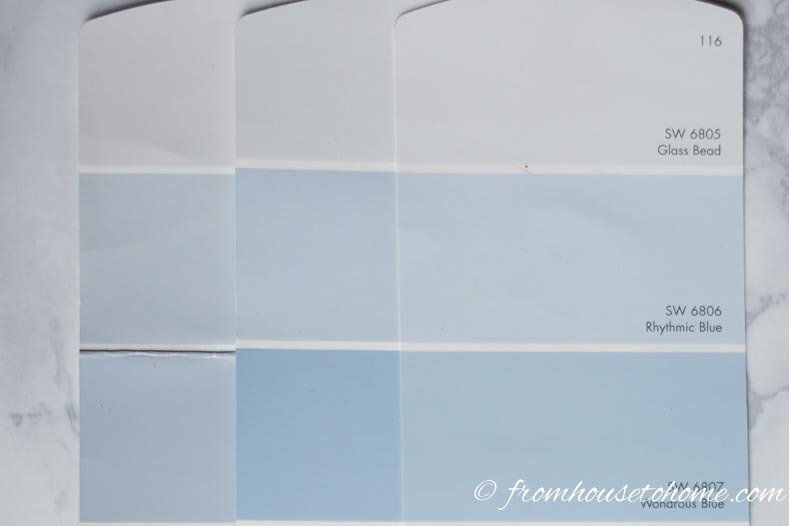 Looking at the lightest colors on these paint chips, it’s pretty hard to tell them apart! But looking at the darker end of the paint chip, you can definitely see which one is more purple and which is more blue. 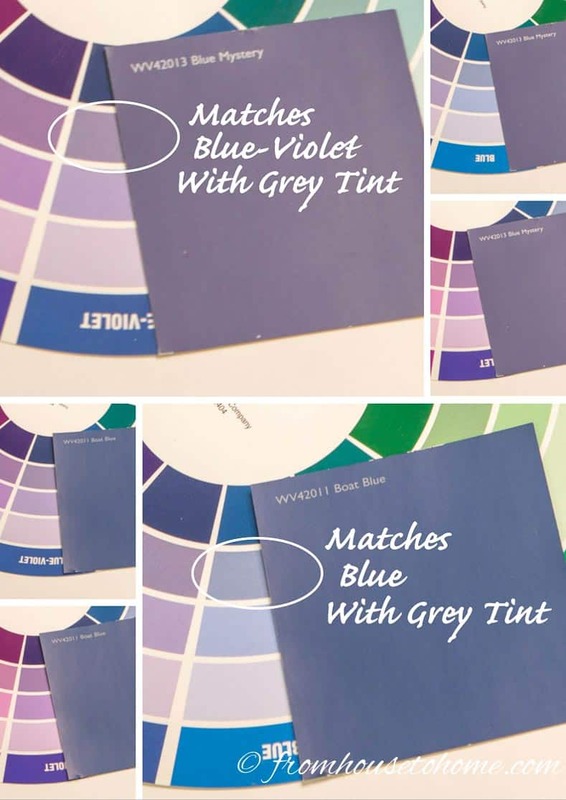 Even if you don’t plan on using a dark color in your room, the darkest color on the paint card is often the easiest one to see what the true paint color is. If you don’t think the darkest color is in the tone that you want, then the lighter colors on the card won’t go either. They are in the same color family, just in lighter tints. Now that you’re gathered a bunch of potential colors, it’s time to start eliminating some of them! The easiest way to tell if a paint color will go with your room color scheme is to compare them directly to your inspiration. Put your paint chips on top of your color inspiration, right next to the color you’re trying to match. There is usually at least one or two that are obviously the wrong color. Remove those ones from your collection of paint chips. In my guest bedroom example, I was trying to match the flower, and I actually eliminated three of my selections just be doing this simple test. If you are like me, you probably thought a color wheel is just something you learned about in school. Well I’m here to tell you that it’s actually a really useful tool for making sure your colors are the right tone. 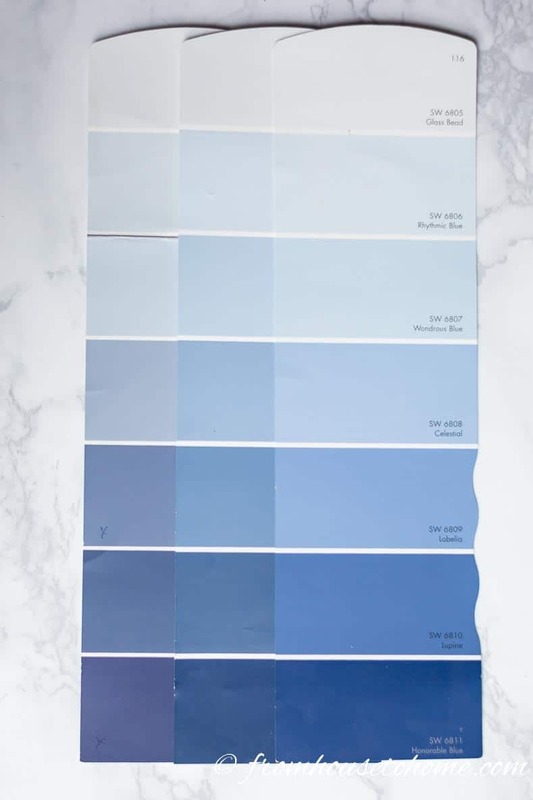 When you get down to a couple of paint chips that look very similar and can’t tell which one would be better (like those 2 dark blue ones from my guest bedroom), the color wheel is your friend! That’s why it’s number 5 on my how to choose a paint color list. What Kind Of Color Wheel Do You Need? Not just any old color wheel will do. At a minimum, you’ll need one that has primary, secondary and tertiary colors. Having the tints is not absolutely necessary, but it does make the matching process easier. This color wheel* is the one I use. It comes with a cover on it, which I removed to make it easier to use for matching purposes. However the cover does give you an easy way to tell which colors to mix together to create monochromatic, complementary and analogous color schemes. So if you want to use it for that as well, you might want to keep it together. 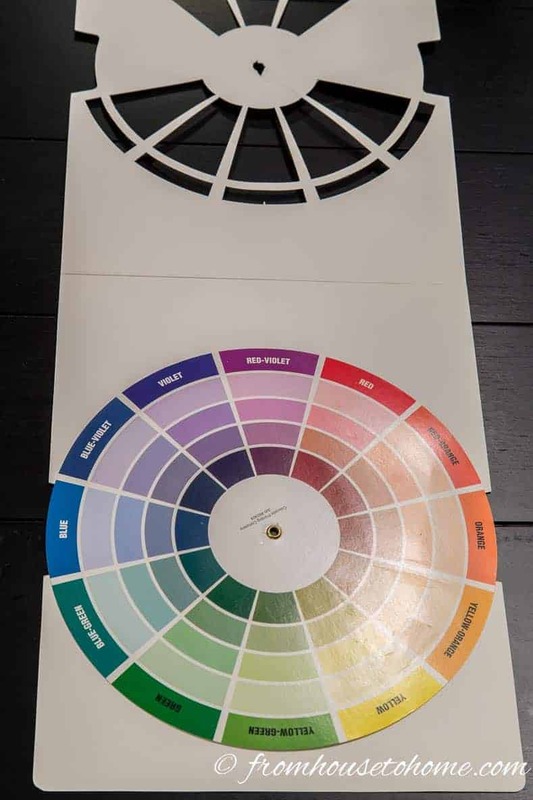 How to Use The Color Wheel To Choose Paint Colors? 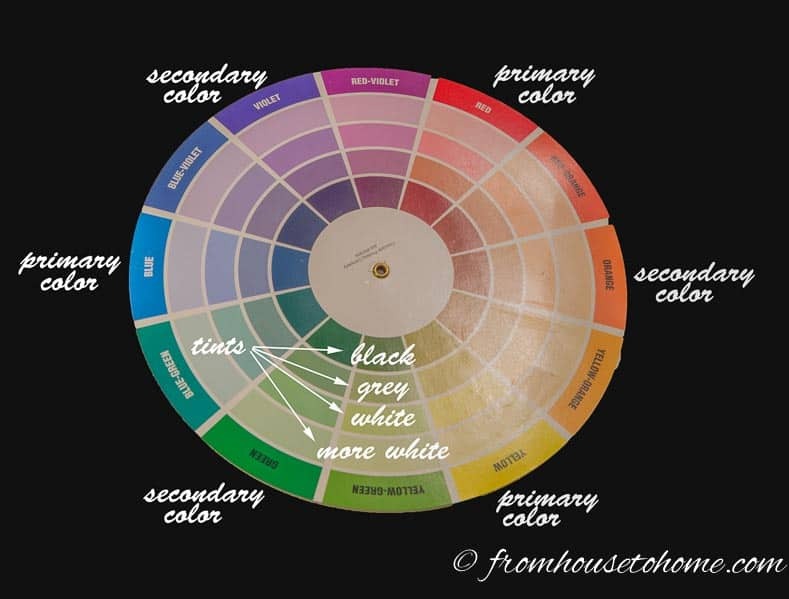 Start by finding out which color wheel section your inspiration color matches. It works best if you can get your inspiration color and the color wheel color right next to each other. Compare the inspiration color against all of the tints of one “pie slice” of the color wheel and see if any of them look like they match. 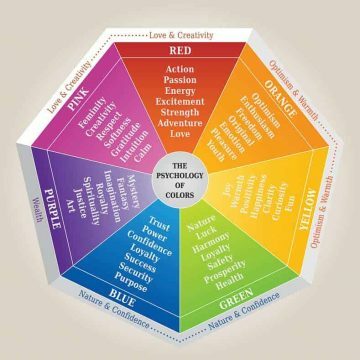 Your inspiration color may be a little lighter or darker than the shade on the color wheel but you can usually tell if they are in the same color family. Always check the pie slices on either side of the one you think is the same to double check that there isn’t a better match. 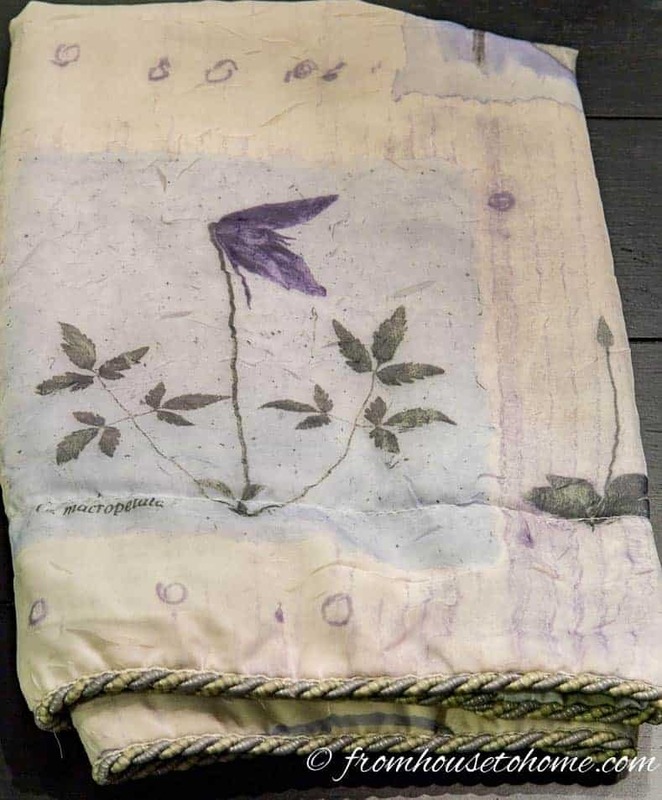 Looking at my fabric, I originally thought that the flower would fall under the “violet” section of the color wheel. And it doesn’t look too bad there. But just to double-check, I tried it against the Blue-Violet and could immediately see that it actually matches much better there. Keep track of which section your inspiration color looks the best with. 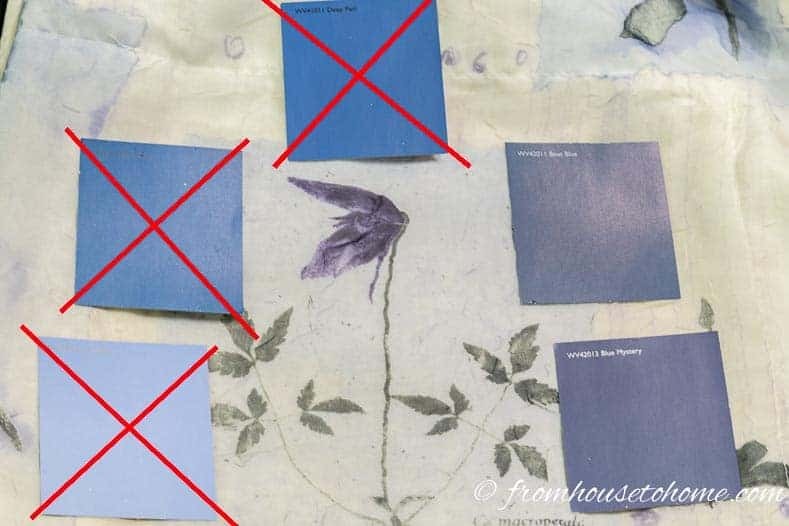 In this case, my fabric color was in the Blue-Violet section and the best tint was the second from the bottom which is the “grey-tinted” blue-violet. Next, repeat that exact same process with your paint chips. Keep track of which colors and tints each paint chip falls into. I usually just write it on the back of the paint chip. Remove any of the paint chips that don’t fall into the same color pie slice as your inspiration. Ideally, the paint chip should match both the color and the tint of your inspiration. But it usually will still be fine if it has the color but a different tint. 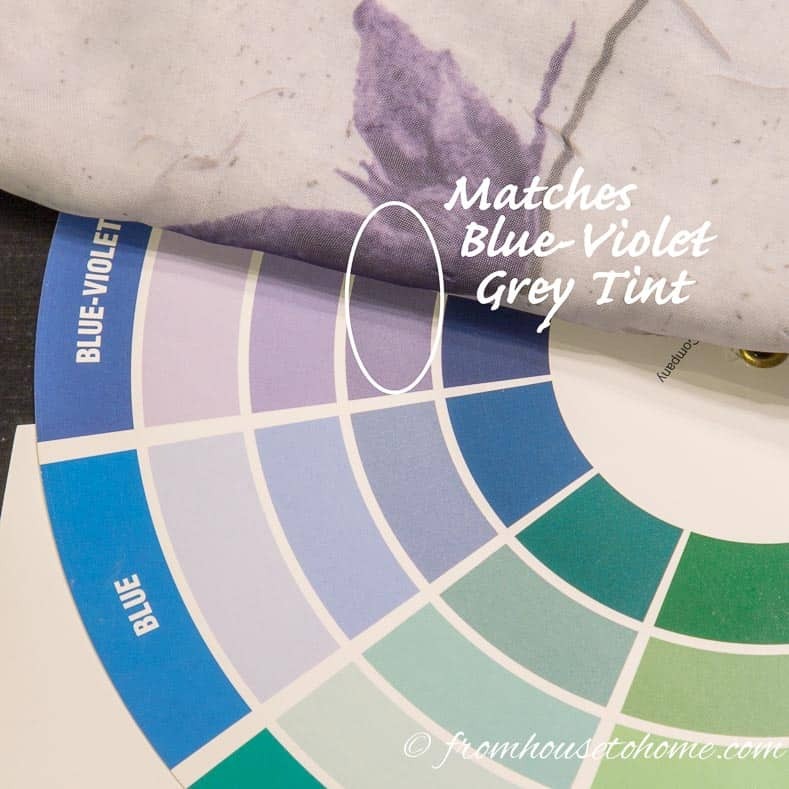 In my case, the first paint chip “Blue Mystery” falls into the same color section (Blue-Violet) and tint (grey) as the fabric. A direct match with my inspiration color! The second color actually fell under the Blue section, so I was able to eliminate it. We’re on step 6 of the choosing paint colors process and hopefully you only have a few color choices left. 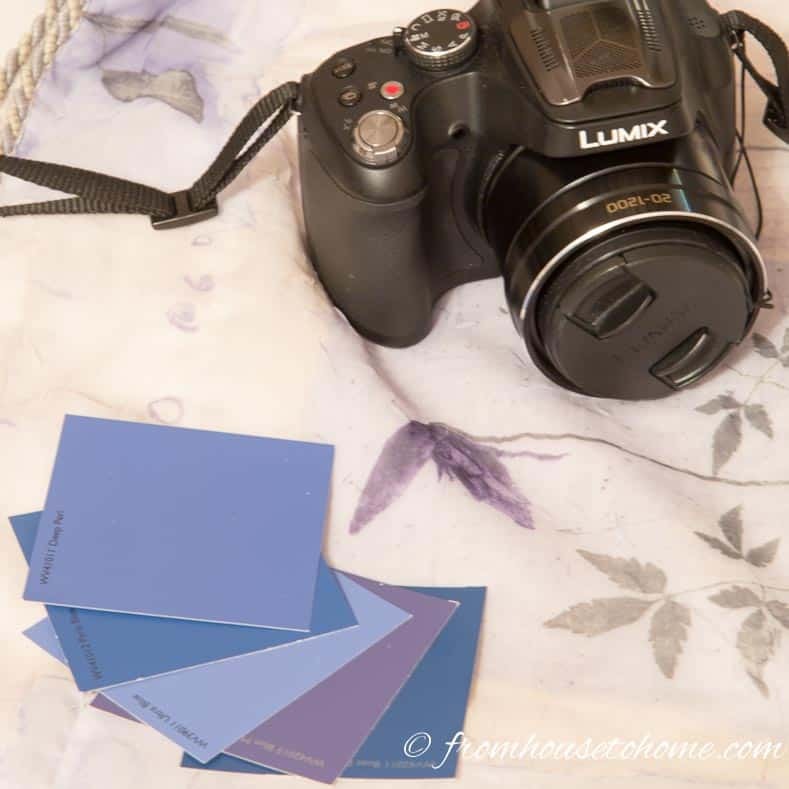 If you’re still having trouble narrowing down your paint selections, it often helps to take pictures. A camera doesn’t do as much interpretation of what it captures as the human eye does, so looking at a picture often makes it obvious when colors don’t really go well together. You don’t need a fancy camera to do this…your cell phone will do. Make sure you are taking the pictures in a well-lit area. It’s also a good idea to use a neutral background color like black or white, otherwise the background might throw off your judgement. Spread the paint chips out on your inspiration piece and take a picture fairly close up (the less distracting background, the better). To get a good representation, you may want to do a few different shots – one in the morning, one during the day with bright daylight, and one in the late afternoon (all of these should not have any lights on). Finally, take one at night with the lights on. Then take a look at the pictures and see which of the paint chips stand out. In my case, it’s pretty obvious from this picture that the paint chip second from the right is the best match to the flower. That’s the same color that came out on top in the color wheel matching…so I’m pretty sure this color is going to be the one! This is the last step of my how to pick the right paint color process and this is where the rubber meets the road. Hopefully by now, you have narrowed your selections down. 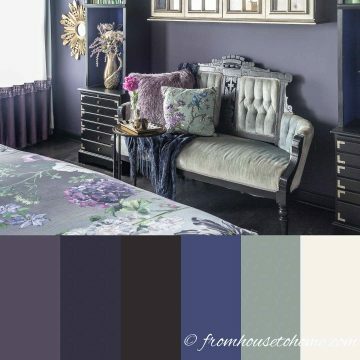 Even if you are down to only one, I would not skip this step of choosing paint colors. This is the stage where you need to see the actual paint…it never looks exactly the same in a large area as it did on the small paint chip. Buy sample cans of each of the colors that you have selected. Almost all paint stores sell them now. For a few dollars, it is worth knowing what you are getting before you paint the whole room. We’ll use these to paint some sample swatches to get a better idea of what a big area in your chosen color(s) looks like. I like to paint a piece of 20″ x 30″ foam board* rather than painting the wall (although that will also work). The advantage of putting the color on a board is that you can prop the board up at different locations throughout the room to see how it looks in different light. It will look different at night under light bulbs than it does during the day. The other advantage of painting foam board is that you can put each color swatch up by itself. When you have the colors side by side on the wall, it’s hard to get a true reading of what the color really looks like (our eyes always interpret color relative to what is around it). Just make sure that the board is standing upright. The color can look different if the board is laying down. Also, note the size on the foam board…you want a color swatch that is big enough to make a statement. Painting a 6″ x 6″ square won’t give you a good idea of what the color will look like on the whole wall. 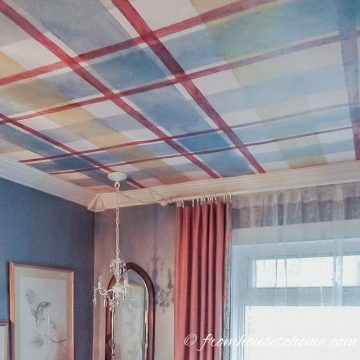 Then try to look at your color at different times of the day to make sure you like it under all of the different types of light in your room. Now you’re ready to take the plunge! Pick the color that you like the best in the room and start painting! Comments or questions on our tips for choosing paint colors? Tell us in the section below. thank you !!!! I am hoping to be paint shopping soon! !